Another year has passed, and another AirFair has flown by. The day opened with low clouds, but they started to clear after a couple of hours. Fly-in traffic started arriving about 10:30, and continued at a slow but steady pace throughout the morning and early afternoon. Drive-in traffic was also constant throughout the morning. Vehicle parking was ably assisted by Scout Troop 317 from Seguin, and Randolph Composite Squadron (TX-142) of the Civil Air Patrol handled aircraft parking for the fly-in guests. The CAP unit was also responsible for manning our snack bar, grilling plenty of burgers and sausages to feed the hungry multitudes. Many thanks to both units for their very welcome assistance! 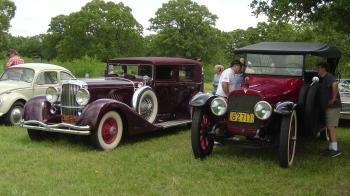 The museum's vehicles were out in force this year. 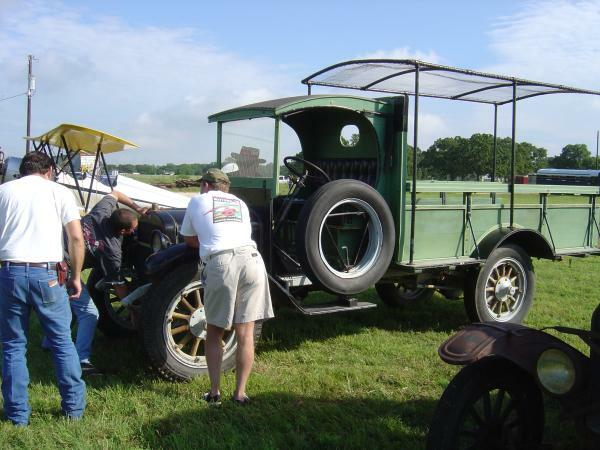 In addition to several of the military Model Ts, the Nash Quad 4, 1918 GMC, and Model T wrecker were all running about, being used as general transportation for AirFair staff. Wayne Belcher was also using the Quad to give rides to deserving youngsters (and any oldsters who could climb aboard). Some of the vehicles were not in running shape, such as our Indian motorcycle and sidecar, but even they were set out as static display items for visitors to view. One of the more impressive new additions to the museum is a Zeppelin maintenance ladder. 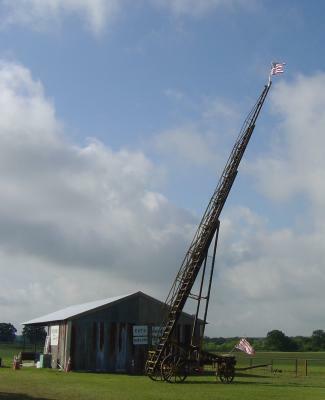 This is a mobile extension ladder capable of reaching to 85 feet (we only had it about half-way up), used by maintenance folks to work on the outside of large diribles. This particular ladder was once the property of the Goodyear Zeppelin Company. Now, of course, we're gonna have to get ourselves a Zeppelin to go along with our ladder. Several attractions at AirFair are provided by groups other than the PFM. The flavor of the Great War is enhanced by the presence of re-enactor groups such as the Border Group and the Western Front. 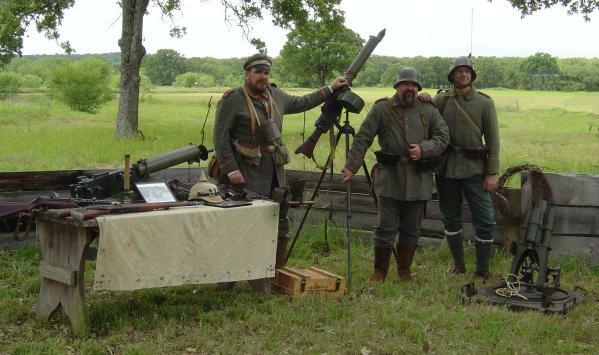 The Border Group set up a campsite to show the equipment and tools available to the U.S. Army in the early years of the 20th century, and the Western Front brought uniforms and equipment of the Kaiser's army in World War I. The Western Front, in particular, always gets a lot of attention by their determined efforts to shoot down flying aircraft with their working machine gun (OK, they're firing blanks, but it still makes a lot of noise)! They provided presentations and demonstrations every two hours of a light machine gun and an MP.18, the world's first production submachine gun, as well as showing the variations that German uniforms and equipment went through during the four years of war. 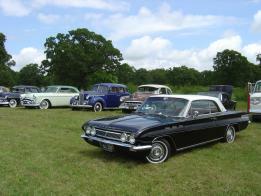 We also had a great turnout from the antique and classic car clubs. 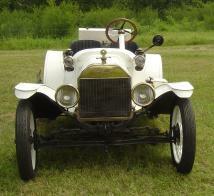 The various autos they brought ranged from a Ford Model T runabout, through several Ford Model As, a Duesenberg, and others up to the early 1960s. These cars were immaculately restored, and I'm sure the owners had to keep wiping drool marks off the paint throughout the day. 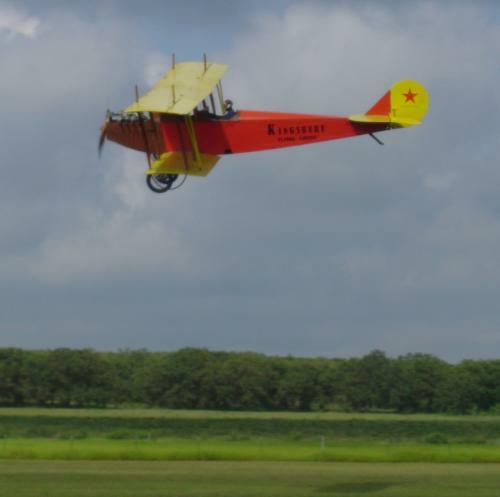 Of course, the main reason we host AirFair is to show off our own collection, and to maybe fly a few. This year, the Thomas-Morse Scout is out of action since it needs to be recovered. 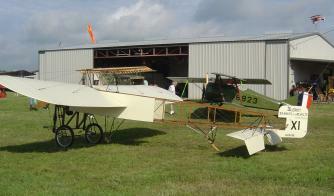 It was present as a static display, along with the Pietenpol Sky Scout, and our Fokker D.VII project. The big news this year is that the Canuck project is finished and flying! Vern Hatch took the big trainer up several times during the day, making low passes and fly-bys down the runway. The Meyers was also flying, showing the difference that only twenty years could make in designing airplanes to perform the same mission. Other good news is that two projects that have been in progress at other locations have been completed to the point that they need to move to Kingsbury. We now have the fuselage for a reproduction Royal Aircraft Factory SE5a on-site, with volunteers starting to work on building wings for it. The fuselage and wings for the Rearwin 2000-C (Ken-Royce) have also been delivered to Kingsbury, so we can start on the final work on this rare Golden Age airplane. AirFair 2004 was a success despite a slow start. Our thanks to out to all of the PFM volunteers and other groups who worked so hard, and we look forward to our fall fly-in and picnic with great anticipation!